Jesus tells us that in serving others we serve him. Here is a prayer, which reflects the spirit of this design. Lord keep me involved, engaged, and entwined with those around me, for they are my channel to you. 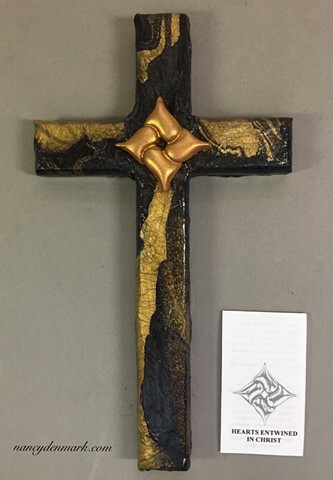 This cross was made in collaboration with collage artist Patti Reed. Wood cross collage by Patti Reed. Polymer clay symbol by Nancy Denmark.